Since 2009 we have been using and selling our own food. 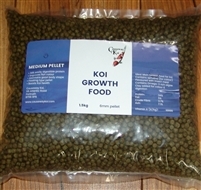 A nutritious, complete growth pellet suitable for all types of fish. Highly digestible, low waste pond food with colour enhancers and vitamins A,C, D & E.
37% protein for feeding at temperatures above 10deg.C. A high quality, nutritious floating food stick, suitable for all types of fish. Composition: Soya, Wheat, Meat and Bone Meal, Maize, Oats, Fish Meal, Lucerne, Minerals, Vitamins, Spirulina. 30% protein for feeding at temperatures above 10deg.C.